The cottage offers that little bit extra that makes the big difference for a perfect family holiday or long term rental. From March until end of May and in September / October the heated swimming pool is offered on a private basis. The cottage provides a double bedroom that has exposed beams with en-suite plus 2 additional bedrooms one being a double,the other a twin and additional family bathroom. The gite is equipped with a wide screen TV-DVD player plus a selection of books for all ages and a few board games to entertain. A well equipped kitchen comprising of a fridge freezer, microwave cooker, washing machine,dish washer, coffee maker and gas cooker. Outside in the garden is a BBQ, a Boule court,a Badminton set, children's swings and new for 2015 a children's play area with slide. For those wishing to enjoy the best of the French cuisine but still keep in shape we have an extensive free weights gym that allows for any ability to have a good workout. The holiday cottage is within easy reach of the medieval towns of Vannes,Pontivy,Hennebont and Josselin, beautiful beaches and the many attractions of The Gulf of Morbihan including Carnac with its famous ancient stones, Brittany's equivalent to Stonehenge and its Grand Plage voted one of the top 20 beaches in France. The Blavet Valley which is renowned for its Carp fishing and its ancient forests offer some fantastic walks and bike rides, Camors adventure forest is great fun for children and adults.If your looking for a golfing holiday you wont be disappointed with the golf courses situated around the Brittany cottage. Auray - St Goustan is always recommended with a great lively market where after wards you can sample the local crepes or seafood over looking this historically famous port. This Brittany holiday cottage is ideally situated and provides everything you need for a great family holiday, its available to rent all year round. Mark and Naomi look forward to welcoming you to our wonderful Brittany holiday cottage where our aim is simple, for you to want to come back year after year after enjoying a fantastic holiday at La Forge. Within the garden we have created a tiny tots play area to keep the younger children happy and there is also a French boules court plus a badminton set available to enjoy. Just 10 minutes away from the cottage you can enjoy Kayak and Canoe safaris along the river Blavet ranging from a couple of hours to a full days adventure. In addition you can enjoy sea Kayaking. From hiring your own boat, sailing dingy or taking a chartered boat trip there is plenty to choose from. Enjoy eating alfresco over looking the swimming pool and garden on your own private south facing terrace. There are facilities to learn wind surfing and other water sports all within easy reach of the cottage. 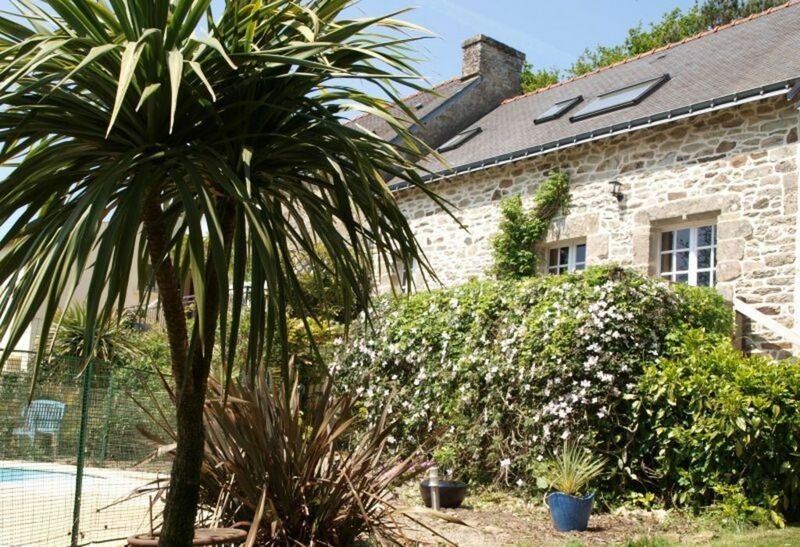 The cottage is situated in a wonderful part of Brittany with numerous golf courses located within a 30 minute drive. Available on a private basis from end of March until end of May and again September / October. Clean and we'll equipped property. Mark was a very helpful host and presented us with good information about the local area. We where on a trip to view properties in the area and were perfectly placed to view Morbihan. Lovely property full of character. My family had a fabulous relaxing holiday in Brittany staying at “la forge”. The property was ideally situated to allow us to explore beautiful villages around the West coast and after we returned from our daily travels our kids thoroughly enjoyed the pool. Made to feel very welcome by our hosts Mark and Naomi. I would have no hesitation recommending this property. It was a pleasure having you all stay and we hope to see you all again in the future. Really enjoyed our stay - the cottage had every thing we needed and the big bonus was the gym which our boys loved. Mark & Naomi made us feel very welcome and were great host. Looking to come back and will recommend to others. In a quiet rural location, conveniently placed 3 miles from the town of Baud, with our most welcoming hosts Mark and Naomi, our week's holiday in Le Veille Maison was excellent! Clean and very spacious, with a very well maintained garden/terrace and views over the surrounding fields and river. Our 6 and 9 year old Grandsons could not stay out of the pool - perfect size and depth, very clean and safe for families - and a workout with Mark in the Gym set their Dad up for the week! August is perhaps not the best time for travel or places being open - many of the French businesses do shut up shop for 4 weeks - and getting into tourist spots requires an early start to get a parking space, but the location made it all worthwhile and there was still plenty of excellent French Cuisine on offer in Baud and nearby Camors. For the Grandparents, plenty of relaxation time and gentle walks. For Mum, Dad and the boys - adventures in kayaks, on Carnac beach and exploring the surrounding countryside - plus hours each day in the pool. Perfect for every taste. Talking of which - Crepes at the riverside port of Auray after a walk through the very busy and thriving Monday market - are a must for any visitor! No hesitation in recommending this property - ideal family choice. We have it on our list to return again one day. We really enjoyed your family staying at our cottage and we hope to see you all again in the future it was a real pleasure. Very nice house! Roomy and great for a family to spread out in. The pool was wonderful - just in the back garden. The garden too was beautiful with lots of pretty flowers! En suite bedroom was beautiful and a very comfy bed! The house itself is very close to lots of interesting towns like Vannes, Auray, Josselin to name a few and the location is very peaceful. Naomi, Mark and James made us very welcome and we would love to come back! :) Highly recommended!! We enjoyed a lovely spring holiday in La Forge this year at the start of May, with the pool and garden to ourselves we felt very spoilt and to top it all had great weather for the entire holiday. The cottage itself has everything you need and was full of character and charm as where our host Mark and Naomi who provided us with lots of great recommendations of what to see and where to eat. We also enjoyed eating alfresco on our terrace overlooking the pool while watching some spectacular sunsets. This was our second stay in La forge and I am sure we will be back again as there is so much to see and do in the local area - have recommended it already to friends and family. Thank you Natalie and Tim for your lovely review of our cottage - it was a pleasure having you stay and we hope to see you both again soon. From March until end of May the swimming pool is offered on a private basis. When booking La Forge receive a 20% discount on your Brittany ferry crossing.